The trendy beach. 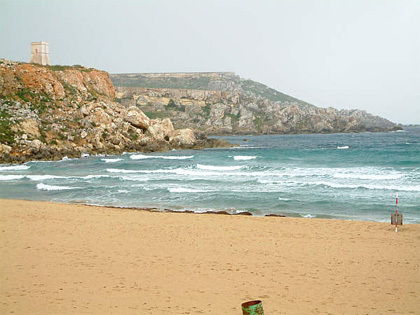 This beach is probably the second largest in Malta. Very fine sand and reddish in colour, you'll love just dropping down and relaxing. It's the beach I frequented the most. You will love swimming here. Don't miss this one. It's very easily accesible, with a car park just at the side. Go down a few steps and you're there. It's quite busy, but the atmosphere is always good. This beach is very popular with the youths and its ideal for children. You'll find good food, drinks, sun beds, umbrellas, and all you need. Getting there. Follow directions to Golden Bay from Xemxija. You can get to Golden Bay easily by bus, car and even bicycle. Bus no. 47 goes to Golden bay from Valletta while bus no 652 gets you there from Sliema. Facilities - Water Sports, Canoes, Paddle boats, Sun Beds, Umbrellas, Food, Drinks, Ice Cream, WC, Internet.